70 lbs. to seat beads. I now have a working back brake!!! virtually nonexistent and I get the "running on rails" feeling cornering over 30 mph. HEY MODERAYTAHS!!! TIME TO START A HARLEY FORUM!!! Re: 1st Heritage gone Darkside! I got just a teeny bit of wiggle at speed, like going down a grooved highway, but less noticable. Took her up to about 90 and it was like sliding down a giant stick of butter! Smoooooooooth...and I notice the bumps thru the front end but the back just swallows them. It's actually slightly better than I expected, and I took some mountain curves on the floorboards (under 50) just for fun. Wow. What's this thing gonna be like when it breaks IN??? WOOT! Told you you were over thinking the whole thing. Welcome to the darkside. Enjoy it. Excellent and Congrats on your darkside. Darkside Rulz!!!! Now just play with some air pressures like 4-5psi up or down until you get the feel you like from the car tire. Then ride it like you stole it!!!! jedishon wrote: Told you you were over thinking the whole thing. Welcome to the darkside. Enjoy it. Exactly what I was saying......quit thinking and just do it!!!! LOL Some things just can't be explained and have to be experienced! What size tire is it? and what year is it? Hot dang, I'm glad you asked: I checked and the number is 0910, or Nov. 2009, so it's new! What is taking me a little getting used to is the lean initiation. Once you lay her over, it's rock solid at 35 lbs. air, riding solo. I just have to remember until it becomes automatic to simply be slightly more aggressive when diving into a turn. Slow speeds have proven easy: I could cone exercise right off, if I assume from turnarounds in 17' and full lock takeoffs. Will try double up later, after I get more used to any new feel. Attempting to get on the busy interstate this morning had the ramp jammed up: I started to go down the shoulder and saw a cop with the disco lights at the bottom and hit the brake - the tire said "LOURCH!!!" and pretty much impressed me - the MT would have just silently slid without slowing me down. 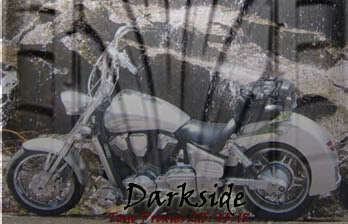 Welcome to the darkside Quad,I started a HD forum for yall. Can you go ahead and move this thread to the Harley forum so that there's something in there for folks coming in? Today we ride to the SCRC rally in Commerce Ga. Hope to see some DS riders there besides the 4 of us! I think we have a convert!!!! Man, I was a convert in the second month of study! quadancer wrote: Can you go ahead and move this thread to the Harley forum so that there's something in there for folks coming in? Today we ride to the SCRC rally in Commerce Ga. Hope to see some DS riders there besides the 4 of us! I'd be happy to move it, but the man won't give me the power! Or I don't know how! I know it can be done - where's a mod when you need 'em? I put Deb on the back yesterday and my bud Jeff behind us to watch the tire. I ended up with 36 lbs. as our sweet spot. I was also surprised that it got even smoother with her aboard! It feels like a bike tire now 2up, and the dive force is a little less than when I'm solo. I painted a stripe across with shoe whitener and I see that we never get on the sidewalls at all; the tire just adapts to the road. I have about 90% tread contact when going straight. It's fun to watch cracks and bumps get hit by the front tire disappear at the back, like they never existed. The comparison makes the front end feel a little rough! It's done! I thought Smokey had done it...sorry! We ran the Chatahoochee national forest today with a lunch run up to TWO (Two Wheels Only) with the hammer down. With storms predicted, there was little traffic when we went up, and I chased our lead bike (big Kawasaki)that had a MT still on - he couldn't get away from me. We both were throwing sparks at nearly every other turn and full-throttle blasting to the next. I did this before with the Pirelli Night Dragon and I have to say, I can corner better on the CT, just ramming it in and holding the line. Some of this may be the slight additional height, but that wouldn't be much up front, so it has to be the tire. I'll need new floorboards soon enough! I still feel like air pressure is not optimal, but I really can't decide wether up or down would do. 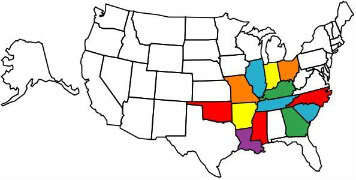 I may need a controlled envelope such as some interstate cloverleafs where I can compare pound by pound. 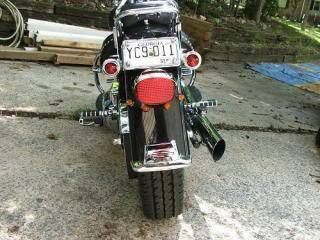 I have been using car tires on Harley's for a long time. Just sold my FLH with a lopdun car tire on it. They work great by the way. I had a VTX 1300S with a CT and I really liked it. 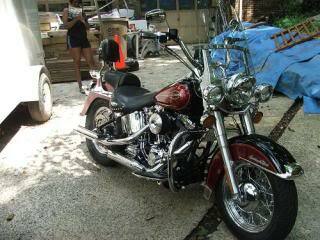 Now I have a '09 Harley Ultra Classic and wil need a rear tire soon. Anybody have brands and tire sizes they are using? Can anyone advise the CT needed for a 2001 Electra Glide Classic? Just learned yesterday about Riding the Dark Side. Great timing as I was going to buy next weerk front and rear tires for my 2001 Electra Glide Classic. Can some one advise the brand and sizes I need to purchase? What size tire did you use? I have an 07 Heritage and I am considering going to the darkside myself. What size tire did you use that will fit, and what brand, etc? Thanks! There are other valuable links in the thread, if you want more info. 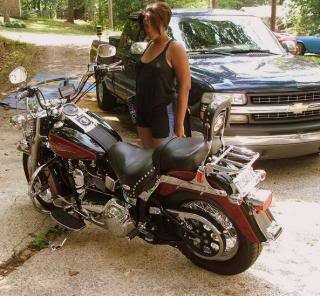 My riding buddy has an 08 Ultra Classic (beautiful bike) and would LOVE to come over to the dark side. Has anyone had any luck finding a tire that would fit an UC? He gets about 4 grand out of the tires he is using now so it is getting expensive to ride as much as he and his 'ol Lady like to. http://darkside.nwff.info/database.php We've been locked out from putting new info in, except for the mileage database on the main page. No one knows when they'll have it up; been down for months. Thats great news!! I'll tell him in the morning, thanks for the response.